Q: How do I make my course available to my students? The home page of your course will indicate that it is unpublished and have a button for publishing to make the course available for students. 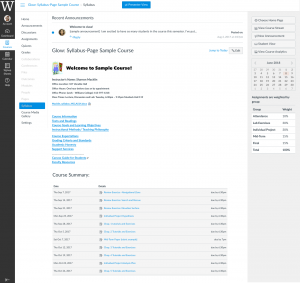 Click the Publish button under “Course Status” in the upper right hand corner of the page. Students cannot see your course and content until you publish it. The file repository indicates that files are locked (unavailable to students) when the icon for the file has a padlock on it. There is a lock icon in the settings that can toggle the lock status of the file. 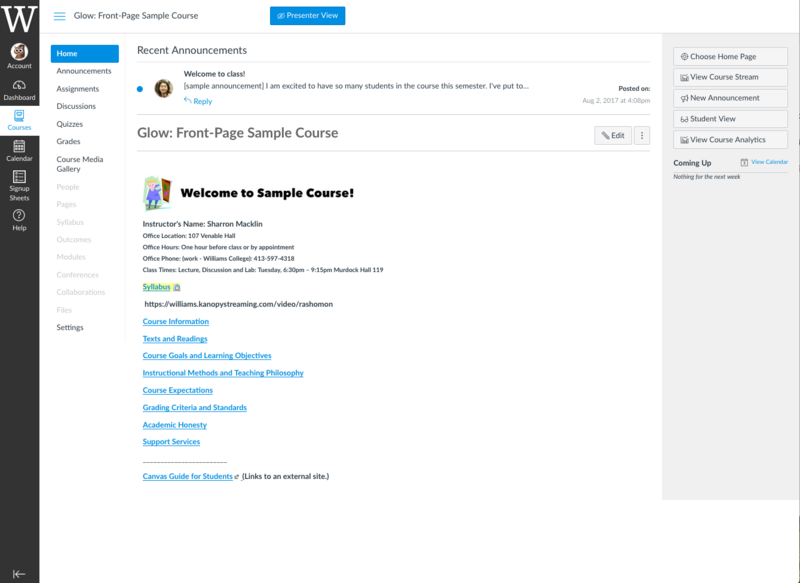 Content areas in Glow can be made to be available or unavailable to students even after a course is published. To the right of modules, pages, or other content will be an icon in the shape of a cloud. If the cloud is a light grey color, then the content is unavailable to students. You can click on the cloud to toggle the availability. When the cloud is green, the content item will be available to students. In the case of modules, you will want to make sure that the parent module is available to students as well as the content items listed in that module. Both the cloud for the parent module and the content items in the module will need to be the color green. Green clouds indicate that course items are visible to students. Grey clouds indicate that content is not visible to students. In addition, there is a files repository. You can use Settings > Navigation to hide menu items from students including the Files menu item. When students view the course, the Files menu item would not be present. This effectively hides all the files in the file repository. You could then selectively share files by linking to files from a page or module. However, there is also the option of keeping the Files menu item accessible to students, but controlling what students can see or access. When you hover over an item you can see icons for a padlock, pencil, and trash can. Clicking on the padlock icon will allow you to lock the file and make it unavailable to students. You can also make the file invisible to students. The file icon will appear to have a lock on it if you select either of these options. In the settings area, you can click on the student view icon in the upper right hand corner. This will allow you to see the course with a student view and verify if students can or cannot see various course items and components. Once you have uploaded content and made it available or unavailable to students, you can check on your work but going to Settings and using the Student View button in the upper right hand corner. This will allow you to explore the course and see the course as it will appear to students. Click on the File menu item and test the accessibility of the files there. Also look at any modules or pages you have added and see if you can see them. To exit student view, there is a blue button in the lower right hand corner that says "leave student view." Q: How do I add my course syllabus? Modules (default course Home Page) are used to organize course content by topics, weeks, units, or a different organizational structure. Modules essentially create a one-directional linear flow of what students should do in a course. Each module can contain files, Discussions, Assignments, Quizzes, links and other learning materials. You can add existing content (e.g. Assignments) or create a new entry (e.g. Page or Discussion forum) within the modules. Modules can be easily organized using the drag and drop feature. Elements within the modules can also be reorganized by dragging and dropping. Here is how to post your syllabus file as a Module item. How do I publish a Module? You can also use the Syllabus Page or a Page to post your syllabus as shown below. When you use the Syllabus Page, “Course Summary” is automatically generated based on Assignments and Events within a course. The “Course Summary” can only be changed by editing or deleting the Assignments or Events. All Assignments (unpublished and published) are listed in the Syllabus Page for instructors, but students can only see published items. The Syllabus Page makes it easy to communicate to your students what will be required of them throughout the course in chronological order. In addition, you can insert text, links, images, videos and audio above the “Course Summary” section. Here is how to upload your syllabus to the Syllabus Page. 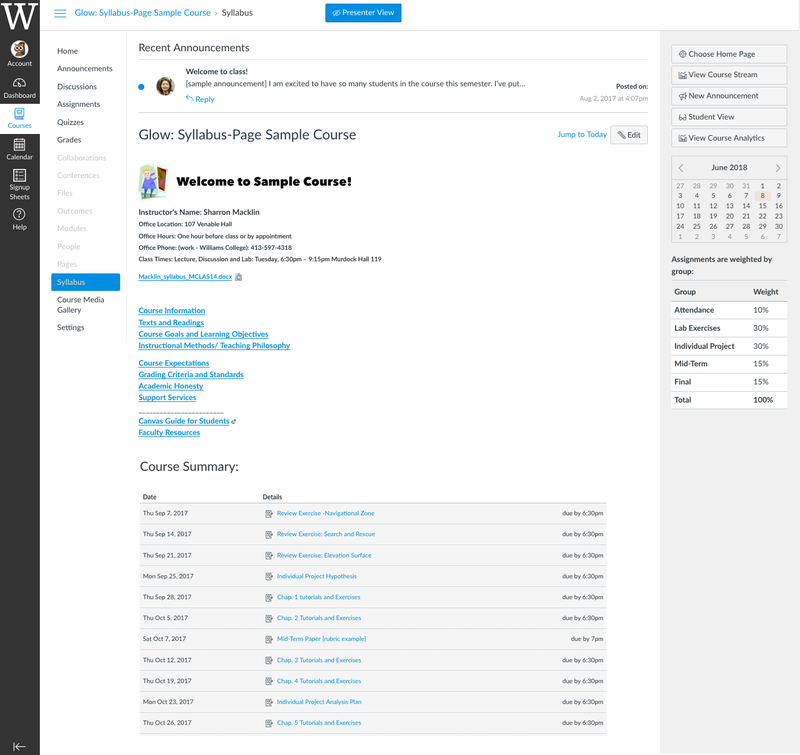 You can design your course home page (Front Page) with text, images, media, and links. The links can be to files (e.g. syllabus in PDF or PowerPoint lecture), other Glow Pages, Discussions, Quizzes, and external content. 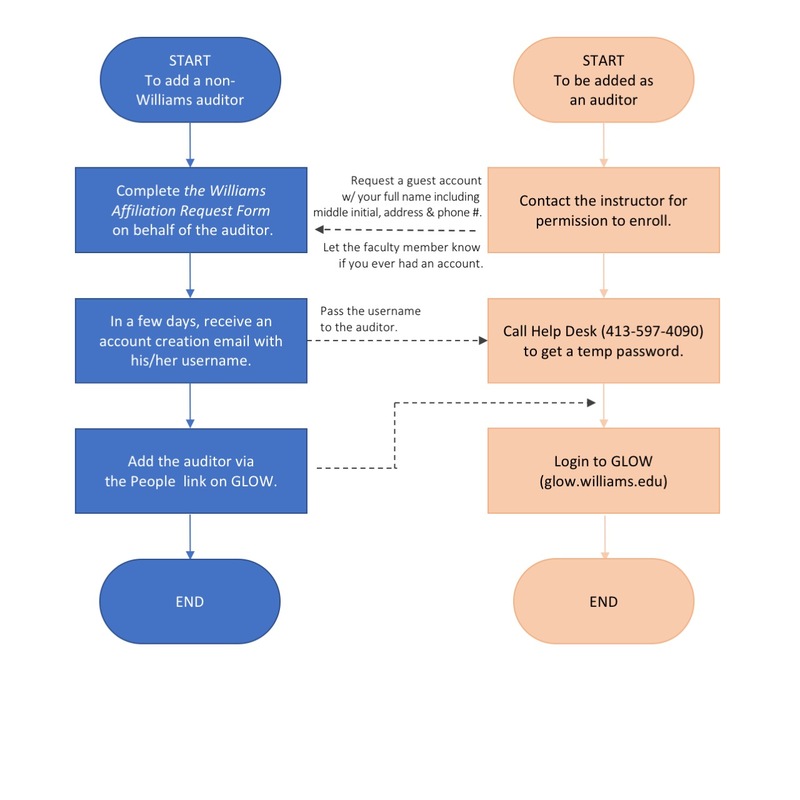 Here is how to upload your syllabus to a Glow Page. How do I set a Front Page? Q: How do I merge multiple sections into a single section? 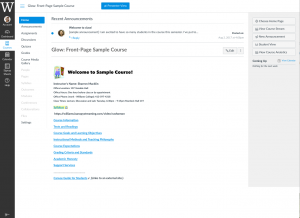 If you teach a course with multiple sections of the same course content/assignments, and don’t want to duplicate them in each section you teach, there is a way to consolidate and merge your sections into a single course on Glow. This is called “cross-listing” which allows you to move all enrollment in one course (section) to another course (section). For example, if you teach two sections of Economics 110 (15F-ECON-110-01 and 15F-ECON-110-02) and would like to use 15F-ECON-110-01 as the parent course of the two sections, you go to the settings of 15F-ECON-110-02 to cross list it to 15F-ECON-110-01. Click “How” here to learn how to cross-list sections. You can also watch a short video on Cross-listing. Q: How do I add a non-Williams auditor? After the auditor account is created (or renewed), you can enroll him/her the same way as you enroll those who have Williams username as described below. Officially registered students are automatically enrolled into your corresponding Glow course and you do not need to add any students. However, you can invite other students to join your course via People link. Use Unix ID or Williams short-style email addresses (e.g. jfs1@williams.edu, not [email protected]) to find the student in the system . – How do I add students and TAs to my course? – How do I remove a student from my course? Teacher: Teacher can add content items, grade students, add users and change some course default settings. TA: TA has almost the same rights as a Teacher, but can NOT view nor edit grades. Grading TA: Special TA who has access to the Gradebook, Assignments, and Discussions, but NO editing rights. Grader-Homework: Special TA who only have access to the Gradebook and Assignments. NO editing rights. Student: That’s self-explanatory, they generally have fewer privileges within a course. Designer: By default, the Designer cannot edit grades, nor add/remove users. They can edit course content. Generally speaking, the Designer Role is best suited for the instructional designers or curriculum writers who write and manage course content. Observer: The Observer role can be used to enroll auditors and guests who would like to participate in a Glow course but do not need to earn course credit. Observers have limited permissions that allow them to see what is going on in a course without interrupting the flow of daily course communication. Q: How do I copy course material from my old GLOW course to a new one? 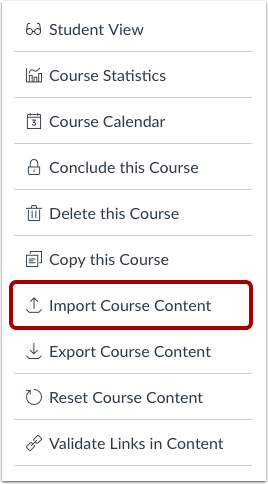 To copy course content, assignments, and quizzes from previous semesters, use the Course Import Tool from the Course Settings. 1. Go to your new course, then in Course Navigation, click the Settings link. 2. Click the Import Content Content button on the right. To import all content from the course, select the All Content radio button. If you want to select specific content, click the Select specific content radio button. 7. Click the Import button. Q: How do I request library DVDs to be streamed in my course? Q: I am registered for this course, but I don't see it on Glow. What's wrong? Q: Why am I not able to attach files to my Discussion posts? Please notify your instructor about this problem. Attaching files to a Discussion will be possible once it is changed in the course settings. The settings are also available in the Discussions Page or the Course Settings Page. Please direct your faculty member to this page for more information. Q: Where is the signup sheet and how do I sign up for openings? 1. Click the Signup Sheets link. 2. Click the Available Openings link. To see all the openings for this sheet in a text-based list, click the “List Openings” tab.